Most people have heard the old adage that “a picture is worth a thousand words.” Well, in this industry, it can also be worth that many dollars, or more. Aestheticians around the world chronicle the progression of clients’ skin conditions in many ways. But, one of the most effective ways to take success stories from word of mouth to tangible evidence is through before and after photos. Not only does this serve as legitimate proof of efficacy, but when executed ethically, it is also an effective marketing tool and often influences potential clients’ perspective positively. This can lead to new clients and increased retail sales. There are thousands of products on the market that claim to eliminate fine lines, clear acne-prone skin, or achieve body goals that are highly sought after. What makes a few companies break through all of the noise is the reputation they hold. This is where the importance of before and after photos comes in for wholesale buyers. In a time where many consumers are not willing to try a product without first surveying the outcomes that other clients received, having visual confirmation of a product’s effectiveness is beauty gold. It is clear that many clients are looking to see dramatic changes in their appearance when consulting an aesthetician. These photos act as a powerful representation of the results a potential client may receive after weeks of treatment, leaving the power in the spa owners’ hands to choose products that work best for their clientele. With a range of skin and beauty goals comes a range of expectations placed on spa professionals, as well. Many clients assume that consulting a professional means the issues they have with their image will be completely rectified in a matter of days. And, though there are some procedures that may produce rapid results, there are many that require a series of treatment. 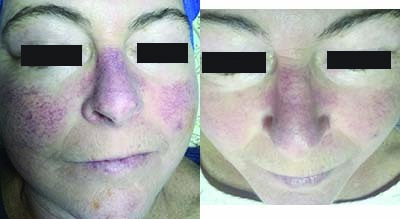 Being able to provide before and after photos allows clients to see what another client looked like at the end of a treatment and gauge what their results may be based on the level of extremity in the model’s case. These photos can also be a “light at the end of the tunnel,” making treatments with a slower results clock more bearable. When attracting new clients to a spa, there are many tactics that can be employed. But, one that may seem a bit more avant-garde is the use of before and after photos to prove the skill of the professionals and the quality of products and/or equipment utilized. A tactic that is often utilized in the plastic surgery world, the use of before and after photos online and in marketing deliverables can attract clients who are curious about a specific treatment or procedure, but are unclear about the results that they will personally achieve. However, it is imperative to specify that these photos do not guarantee that every client will achieve those results. One way to employ the use of before and after photos is to create a page on the spa’s website strictly dedicated to case studies of clients receiving various procedures. Whether it be the smoothing of cellulite or the elimination of box car scars, chronicling the progression of a particular client through close-up shots in the exact same area, coupled with detailed information about the client, can be a meaningful marketing tactic. It allows the client to compare themselves to the subject and decide if this new procedure or treatment is right for them, given all of the information. If these before and after photos show a dramatic enough change, this is an easy, inexpensive way to bring in more clients simply through regular site traffic. Today, there are over 800 million Instagram users1 and almost 2 billion Facebook users.2 There is not a channel more important to marketing than social media – and the beauty and wellness industries have been using these platforms as a primary source of client conversion for years. To cut through these crowded spaces and inspire brand loyalty, uniqueness and authenticity are key. While many spas choose to amplify relaxation and luxury, many miss the opportunity to prove the effectiveness of various procedures. Boosting posts that include before and after photos allows prospective clients and regulars to see what they could personally achieve by visiting the spa – whether or not the procedure the model underwent is something they personally need. In this day and age, there is an online community for everything. And where there are many people sharing ideas, there is room for much misinformation. It is not only a valuable (and often free) marketing tactic to share before and after photos with commentary about the procedure in these forums (if the forum is specific to the area the spa is in), it is also a chance to educate the forum members, which may inspire them to visit the spa. This is also a great tactic to employ when trying to move product lines that have not picked up steam in store. Spa owners can amp up online retail sales while helping these forum members build an effective homecare routine. The key to acquiring new customers is to stay active in these conversations. Adding a few heavily populated forums to Google Alerts may be a valuable option for staying abreast of these conversations. Though providing before and after photos is not a fool-proof way to gain new clients or push a new treatment or procedure, it is one of the most highly-effective ways to prove efficacy and attract interest. Through education and proper visibility, spa professionals can attract a completely new clientele and give regulars a new reason to feel invested in the spa and what it offers. Using Clinical Resolution Lab’s Wrinkles and Anti-Aging Solution (Vital W) combined with just four InnoPen microneedling sessions, the patient’s wrinkles have drastically diminished, unveiling smooth, wrinkle-free skin. 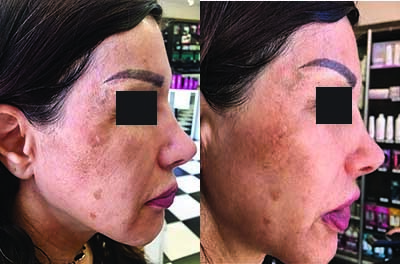 Using Clinical Resolution Lab’s Pigment Stabilizing Solution (Vital PS) combined with only three InnoPen microneedling sessions, the patient’s hyperpigmentation has noticeably decreased, revealing a more even-toned complexion. 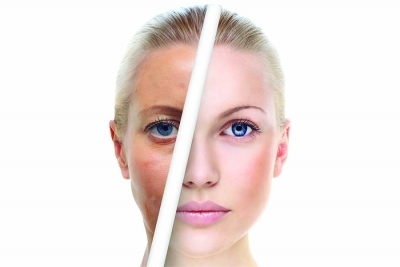 Vital W Solution combined with InnoPen microneedling is the ultimate treatment for anti-aging. Containing sodium hyaluronate, Matrixyl 3000, and epidermal growth factor, microneedling with Vital W Solution reduces fine lines and wrinkles, provides deep hydration, and improves skin tone and texture. Containing stabilized L-ascorbic acid, kojic acid, and alpha arbutin, the transformative power of Vital PS Solution in conjunction with InnoPen microneedling is the optimum treatment for age spots, intercellular melasma, post-inflammatory hyperpigmentation, and sun damage. This 64-year-old used DermYoung I-Genesis Youth Essence once daily for 30 days. At the end of the trial, his forehead wrinkles and crow’s feet were much less visible, and his dark spots were greatly lightened. This 26-year-old used DermYoung I-Genesis Youth Essence twice daily for seven days. At the end of the trial, her acneic skin was transformed, revealing clearer, brighter skin. I-Genesis Youth Essence by DermYoung was developed by scientists at Harvard Medical School. It combines a proprietary blend of natural extracts and 20 percent L-ascorbic acid to reinforce the epidermal barrier, stimulate collagen and elastin production, hydrate and soothe inflammation, and brighten complexion. This lady had many broken capillaries. After one treatment with the Skin Classic, it was nearly cleared. The after picture was taken six weeks post-treatment. This lady underwent a Skin Classic training with many hyperpigmented keratosis and flat hyperpigmentation. After one treatment with the Skin Classic, she was nearly cleared. The after picture was taken six weeks post-treatment. 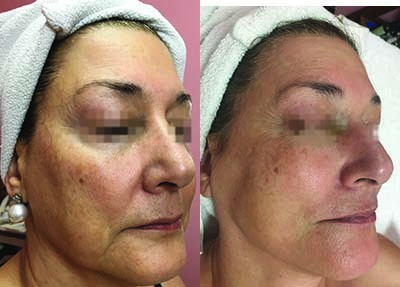 RN Faces’ Skin Classic is affordable, non-laser, cutting-edge equipment. Skin care professionals worldwide enjoy the ease of treatments with a huge “wow” factor. This award-winning Skin Classic delivers direct high frequency for the treatment of broken capillaries, cherry angiomas, hyperpigmentation, sebaceous hyperplasia, milia, acne cysts, skin tags, and keratosis – typically in one treatment. This 43-year-old received BelleCôte’s Sensitive Treatment with Stem Cells in Polished Outlook Salon and Spa in Milford, Michigan. 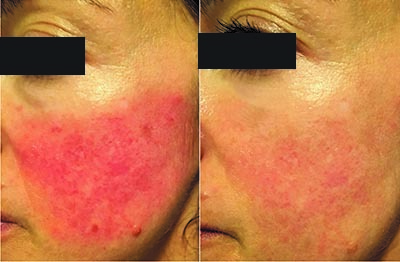 After just three treatments, her rosacea was transformed, revealing calm, hydrated, and inflammation-free skin. This scientifically-advanced treatment combines the powers of Stem Cell Blend, bilberry extract, and marine collagen and elastin complex. Sensitive Treatment with Stem Cells has a tremendous ability to rejuvenate aging skin and replace damaged cells. Bilberry extract helps treat damaged skin with fragile capillaries. In addition, its precious, natural actives develop a calming, anti-inflammatory effect while firming the tissue and protecting the skin from environmental influences and premature aging. This treatment is ideal after microdermabrasion and other abrasive treatments to take away redness, reduce inflammation, and provide a deep hydration. 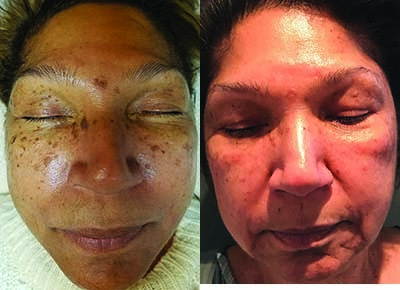 Karen Rowe, a licensed aesthetician in Australia, performed two Synergie peels alternating with two galvanic infusions of Synergie’s Pure C Crystals, Vanish, and Hydrogel, done once-weekly, for over a month, on this client. Fantastic results were achieved for her client, who also used Synergie’s homecare products! 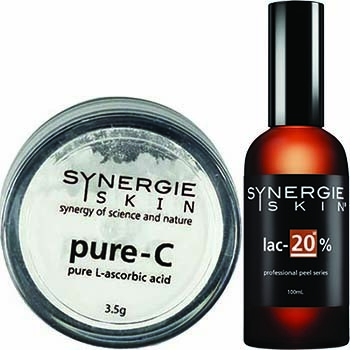 Synergie’s Lactic and Salicylic Peels can be layered and customized according to the individual needs of the client. Pure-C Crystals are activated when mixed with Vanish lightening serum; the combination of L-ascorbic acid and oligopeptide-34 reduces the appearance of uneven skin tone, hyperpigmentation, and sun damage.